Full Motion Wall Mount Bracket, AR240 - HIGHGRADE TECH. CO.,LTD. Highgrade is a leading manufacturer of LCD Wall Mount Bracket in Taiwan. With Design team and all our manufacture are all in Taiwan to best control the quality. We provide LCD Monitor Stand, Touch Monitor Stand, Projector Mount and LCD Wall Mount Bracket. We also supply holders for eReader, such as iPad Holder and Kindle Holder. We provide Wall Mount Bracket with high quality and competitive prices. Wall Mount Bracket is one of our best selling Articulating wall mount series and it is compatible with VESA 400 x 400. With maximum distance from the wall up to 562mm. The weight support can be up to 35 Kgs which covers most of the LCD TVs as the tendency of TV is getting lighter and lighter. 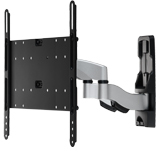 Panel Size Support 26" ~65"
Wall Mount Bracket is easy to install.